When I first began blogging I was completely clueless as to what things were important and what things were not. Sure, in the beginning, I was doing fine with my blog. I was focused on all the right things and working along at a pretty good pace. Then I got that very first taste of ad revenue and my path suddenly veered off to the right. Before I knew it I was spending most of my blogging time doing what all the big bloggers warned me not to do. I was chasing page views. In my head, anything that was going to bring me quick money was worth all of my attention and I totally skipped over all the other things that take time to develop, grow, and show results. Things like growing an email list, focusing on SEO, affiliate marketing, or sponsored posts…haha just to name a few. This was a big time should’a, would’a, could’a moment right there. Make no mistake! Little did I know I was taking the slowest possible path to blogging success. People told me to stop. To focus on my list and other long-term money makers. But I would hear none of it. I had gotten that taste of ad revenue. I am talking viral pin ad revenue and there was no stopping me. So there I was 18 months later and my biggest income was still my ad revenue which was not increasing mind you because my page views had stalled. They were still good pageviews, but they had stopped growing at that wonderful “viral” pace which meant so had my income. That was about the time I woke up and decided I needed a backup plan. A way to bring in income that didn’t depend on my page views at all. A steady stream of money that no matter want my finicky friend Pinterest decided to do it would not affect me nearly as much. How crazy awesome would that be?? I had finally decided to put my focus on building my email list by creating an irresistible email opt-in. My plan was simple. I would spend 1 hour every single day working on building a strong dedicated list of raving fans that wanted to hear what I had to say and wanted to buy what I had to sell. I started that very day and have made that my goal every single day since. It totally and completely worked!!! That my friends come out to be 12K subscribers every single year. All from just changing my focus and rearranging my game plan. Now before you leave here in a panic this is NOT a sales page. This is a blog post with actionable steps you can do to grow your list. Right now. Today. Not steps to grow just a random email list but the steps you need to grow a list of dedicated focused raving fans that love you and want to be your BFF. Before we dive into the good stuff, let’s backtrack just a bit and get us all on the same page. An opt-in is simply a free product that you offer to your readers that provides amazing value on the subject of your blog post or at the very least your blog in general. But they all serve the same purpose. To offer your readers something of value that will entice them to give you their email address. And why do you want their email address? So you can form a relationship with them and turn them into a raving, dedicated fan that wants to learn from you. A fan that will read everything you have to say and eventually buy what you have to sell. And if you start out working on your email list early in, you are setting yourself up for some fast success. And if you are like me and you are instead playing catch-up, you will find this to be the best time spent on the health and vitality of your blog. Step #1 From this day forward make your email list your top priority. Sure, working on your list is a great idea, but why? Well, let me just say this, if you want to make money selling not only your own products but selling other people’s products as well, your biggest and best audience will always ALWAYS be your email list. These people already know you and trust you. They are your target audience!! If you want to grow your email list what exactly should you spend your time on? Put your focus all on creating new opt-ins or lead magnets and trying them out to see if they will convert. If not you must then go back to the drawing board to tweak things a bit and try them out all over again. This part can be just a bit frustrating I know, but if you skim over it you will just create more work in the long run. Ninja tip: If you happen to find an opt-in that works…..DUPLICATE IT! Yep, that’s right. Usually, if it worked once it will work twice and sometimes (sometimes) even three times. This is especially helpful if you are a multi-niche blogger like I am. If you do not have a niche or do not know if you have a niche, you need to stop and do just a little bit of homework first. 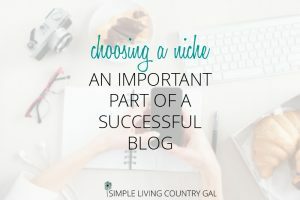 Jump back to my blog and check out my article on choosing the perfect niche for your blog. Step #2 Find the perfect product for your readers and give it away for FREE. I know, I know… not an easy thing to do. If the product is perfect, after all, shouldn’t we want to sell it and make money?? In a world full of hackers, spammers, email marketers, and stolen identities giving up your email to a stranger isn’t easy. So in exchange, it is only fair to offer the perfect product for free. Something so amazing that folks won’t think twice about giving you their coveted email address. Okay, that sounds simple enough, but HOW do you find the perfect opt-in? You take off your shoes and put your feet into your reader’s shoes. Picture a brand new reader. Someone who stumbled onto your site from Pinterest, let’s say and is looking for help or information. They are drawn in by your Pinterest pin title and image and as they are reading your content they are drawn in even more by each paragraph. As they read they are becoming excited by what you are saying and they can’t wait to try out the tips and steps in your post. Now think….what one tool would help them take your information and implement it into their lives? Whatever that item is….. MAKE IT! That is your irresistible opt-in! Think of what questions your readers might have, and answer it with a freebie. Step #3 Wrap it all up in an attention-getting pretty package. Some folks might not think this is an important part of getting subscribers but actually, it is. If your sign-up box doesn’t stick out. Your readers simply will not see it. Make it bright by using colors different from your blog colors. Choose a font that stands out and type it in big bold letters. The trick is to make sure it does not blend in with your blog post, your ads, or any videos you have included. 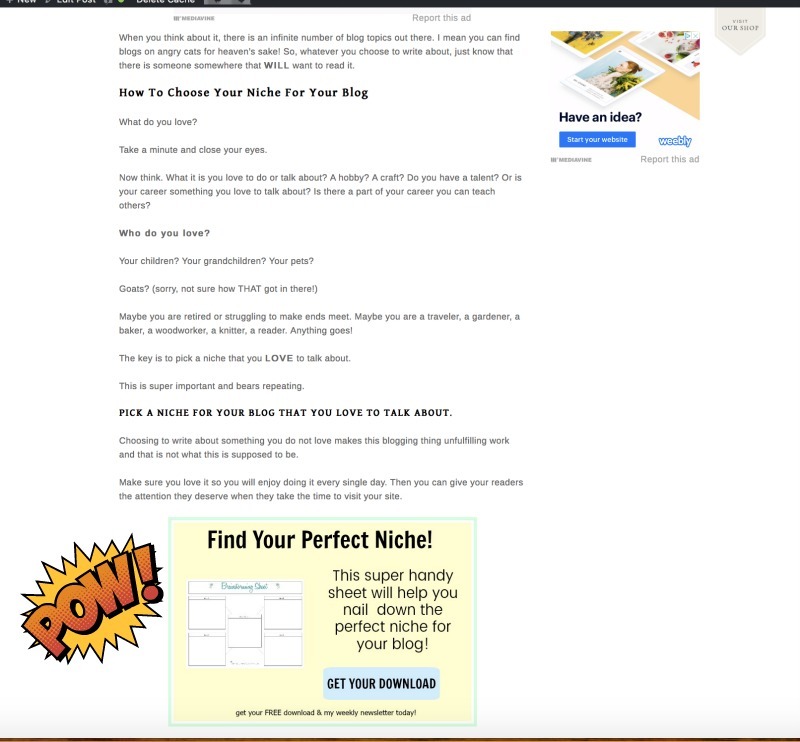 You want your opt-in box to stand out and stop your readers in their tracks. Visit other bloggers in your niche. 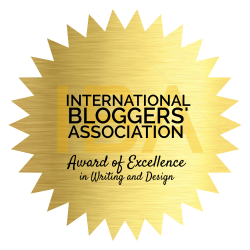 Bigger bloggers that have been at this a while and are ones you love and admire. See how they are using colors and fonts to stop you in your tracks and then click to subscribe. Please, PLEASE use this tip for inspiration only. It is never okay to copy! It is okay, however, to learn from others that are killing it. Look, learn, and create your own. Step #4 LOCATION, LOCATION, LOCATION. When creating an irresistible opt-in, location matters much more than you think. Sure you can go to all the trouble of creating the perfect FREEBIE and even pick the best colors and font so it stands out. But if you then go and stick it in your footer or sidebar you will only hear crickets. That’s when you realize location really DOES matter. The best place to put your offer is where your reader’s eyes already are. Right in the middle of your blog post. And even better, right where it is needed most. When you are writing your post that is the best time to be in your reader’s shoes. As those ideas flow and you are typing away you think, hmmm, this is a lot of information to give them. I bet they would LOVE a checklist to help them when they are ready to implement these steps on their own. The perfect spot for your irresistible email opt-in. Then just to make sure you get even the skimmers (those folks that skip to the bottom looking for the good stuff) I would put an opt-in box at the end of your blog post as well. Now, let me just jump in here and say I am not a fan of obtrusive opt-in boxes also known as pop-ups. They annoy me when I reading a blog post especially when I am on my smartphone. They drive me NUTS actually. And if I don’t like them then I am sure my readers don’t either. For that reason, I choose not to use them. As a less intrusive option, I like to use a Hello Bar. A Hello Bar is simply a ribbon that you place at the very top of your blog. You also have the option to make this bar a “sticky” and follow your reader as they scroll down the page. The Hello Bar is small and does not hinder the reader’s experience in any way. It does take up a bit more reading space on the phone, but it is still not intrusive and that is my overall goal with my opt-ins. To catch my reader’s attention without being annoying or intrusive. In my opinion, Hello Bar is a simple way to politely tap your readers on the shoulder and ask them to join your crew. The best part is they have a FREE version that works great and who doesn’t love free! Here is an example of my Hello Bar…. As you can see, the Hello Bar is neon green and not a part of my brand colors of teal and pink. It stands out nicely and really does grab my reader’s attention. In the few months I have been using it, I have found that it offers great value to my readers, takes up little space, and as a result converts nicely for my blog. Step #5 Choose the words for your irresistible opt-in carefully. Just like when you are creating a title for your blog post this is where you need to spend quite a bit of time. You have a very small amount of space to win over your brand new reader so you need to make the most of it. Choose words that draw them in. Words that grab their attention quickly and get them to stop reading your awesome blog post and click. You try something out. Test it. Tweak it. Test it. Tweak it again. Until you see subscriber numbers that match the popularity of your post you will want to keep trying things until you find a title that works. I know you are looking for a specific answer here and the truth is there simply isn’t one. What works for me will not work for you. That is just how this blogging thing goes. My audience is different than your audience. My audience is tailor-made for ME and your audience is tailor-made for YOU. The words that grab your reader’s attention will naturally be different words that grab mine. So, yes, even though I hate to say it. You will need to find those words that work for your audience specifically and in order to do that you need to just start trying things out until you find what works. YOU DUPLICATE IT, MY FRIEND! You write those words down and use them again and again. As bloggers, it is important to remember that we are teachers and our niche is our subject. Our students are our readers and we want them to hang with us so they can learn more and more. 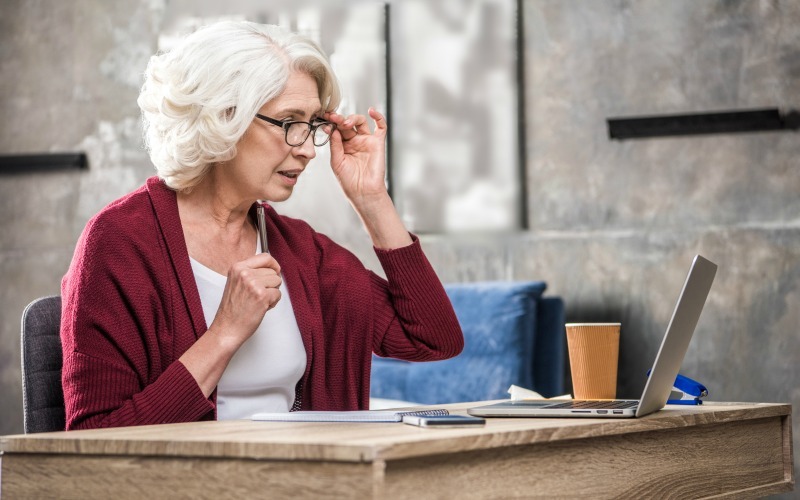 Give them good usable information in your post and back it up with an opt-in that will help them implement that new information in their own lives. Don’t over think it. You will drive yourself crazy if you do. Just simply take a few minutes to get into your reader’s head and figure out what material will help them the most. At first, it will take some time but after a while, you will be coming up with so many ideas you could fill a store. Hmmm, see where I am going with this? Fill that store and sell those amazing products to your email list of dedicated readers that you just spent the last few months growing. That is, after all why we are blogging. To help others and make money to support ourselves and our families. There is one more thing you need to know that will take your opt-in ideas from average to Ah-Mazing! And if you want to get your hands on it, you’re gonna have to Click here to get that elusive STEP #6!!! « Perfecting The Art Of The Gift Closet. My Best Frugal Tip! this is all so amazing. I may need a glass of wine. thanks, tracy! and yes, for everything I think: there’s a blog in this somewhere!